Home »Places»Historic Buildings»The Cutter Question: Who Was the Real Architect? 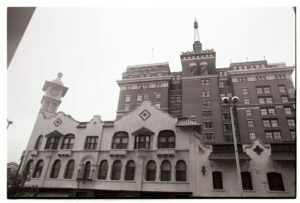 Above, The Davenport Hotel in the 1940s. Kirtland Cutter is credited with designing Spokane’s top-notch hotel. But how much of The Davenport was his work? Research done by members of G.A. Pehrson’s family challenges long-held assumptions. Photo courtesy of the Washington State Digital Archive. My grandfather was Swedish born architect Gustav Albin Pehrson, who designed an impressive array of buildings in the western United States, including Spokane’s Paulsen Center, Roosevelt Apartments, Eldridge Building, Missoula’s Florence Hotel, as well as the town of Richland, Washington as it was built up in 1943 for the Hanford Project. According to newspaper clippings and family archives, other notable Pehrson projects include the Chronicle Building, Western Union Life Building, Schade Brewery, and many residences including the Hebert House, Priess House, Kirk Thompson House, Victor Dessert House and Louie Davenport’s summer home “Flowerfield” along the Little Spokane River (now the campus of St. George’s School). 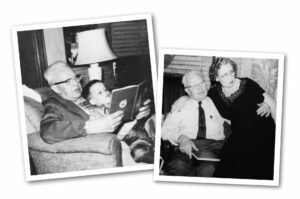 Pictured left, Gustav reading to his grandson, Bob Lawrence. Right, Gustav and Bess Pehrson, at home at Christmas, circa 1960. Photos courtesy of the Lawrence Family Archive. Of course, the Cutter to whom my grandmother referred was Kirtland K. Cutter, whose firm, Cutter and Malmgren, built the Davenport Hotel. According to biographies I’ve read, Cutter’s training was in art. For instance, Spokane author Blythe Thimsen writes in her book, Spokane’s Stories: 28 Stories of the People, Places and Events That Have Shaped Spokane, “Cutter’s lack of formal training as an architect may actually have given him more creative freedom because he was not held to a certain style.” Statements like that are consistently repeated in each Cutter biography, either in print or online. 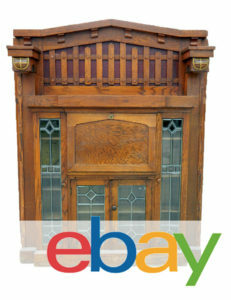 It is true that Cutter contributed greatly to the architectural aesthetic that built the city of Spokane. However, his genius was likely in the concept, not the creation, of such architectural masterpieces as the Davenport Hotel, the Chronicle building, the Glover mansion and the Clark mansion, to name but a few of the commissions to which the providence of history subscribes his name. To his credit, Cutter did design the Hall of the Doges in the original Pennington Hotel, which was later saved and placed in the Davenport Hotel. Cutter’s genius was also in surrounding himself with people who were solidly competent in the areas he was not, whose hands rubbed and caressed sheets of vellum until masterpieces were born. One pair of hands that did this belonged to Pehrson. Pehrson’s own architectural works, such as the Paulsen Center, show that he had his own impressive architectural chops. Pehrson had worked for Cutter and Malmgren before opening his own architectural firm. I knew Pehrson, not as a revered architect, but as my doting “Baba” who used to love spending time at home with his family. So, remembering what I’d heard in my childhood, I wondered what truth there might be in my grandmother’s words. With my friends Tom McArthur and Teresa Smick, I looked into it. Above, Gustav Perhson’s signature on plans for the Davenport Hotel, dated May 2, 1913. Photo courtesy of the Lawrence Family Archive. This past June, I attended a public tour of the Chronicle Building. Tour guide John Feathers stated that Cutter’s firm had taken on the Chronicle Building project in 1926, and immediately turned it over to G. A. Pehrson, who did the designing, planning and engineering. A January 1927 news clipping shows a perspective view of the building which was drawn by Pehrson. 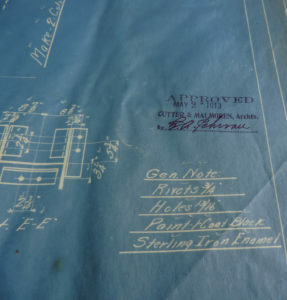 Blueprints of the building were on display during the tour, all bearing Pehrson’s signature. Feathers made a point of saying that although Cutter’s firm created the Chronicle Building, someone other than Cutter (Pehrson) needs to be credited as being the architect. A few years ago, I met Teresa Smick, whose father was hired straight out of college by Pehrson. The two men worked side by side from 1955 to 1964. 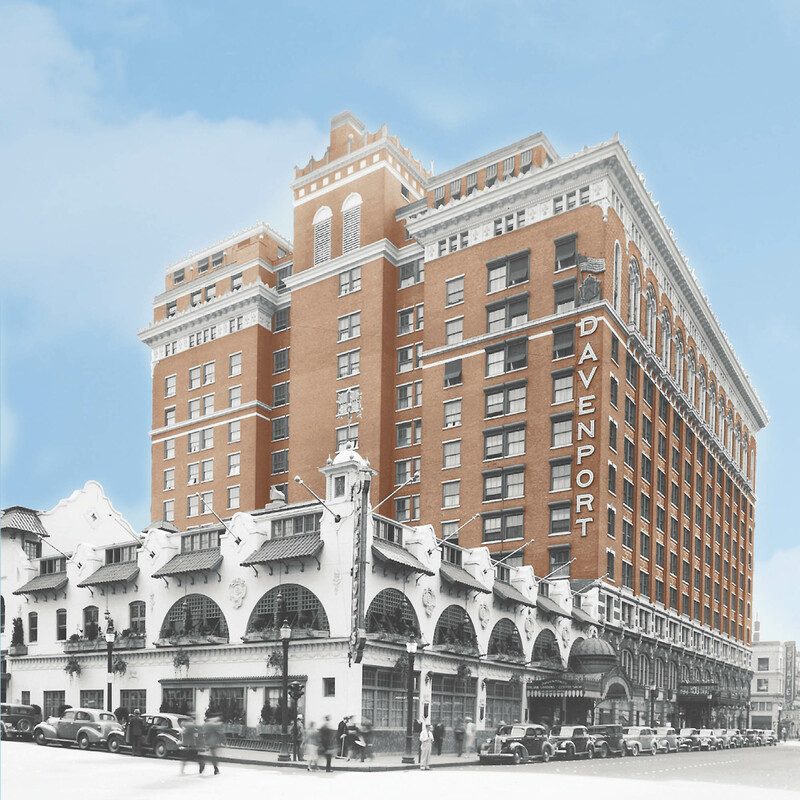 During those years, Pehrson had spoken to Teresa’s dad about having been the Davenport Hotel’s principal architect. My family has design drawings of the hotel, so Teresa and I compared notes to see if we could find any proof of my grandparents’ claim. 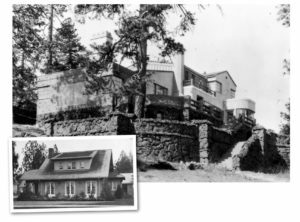 Above, the Victor Dessert home at 1512 South Rockwood Blvd in Spokane, in 1937, designed by G.A. Pehrson. A more modest abode, at left, is Pehrson’s own home at the corner of Shoshone and Post in 1924. Photos courtesy of the Northwest Museum of Arts and Culture. Pehrson is actually credited for additions to the Davenport, including the Delicacy Shop (1917) and a later remodel, the Pompeian Baths (1923) and the thirteenth and fourteenth story additions (1929). As proof that the two men had a close bond, L.M. Davenport is listed as “a person who will always know your address,” on Pehrson’s WWII draft registration card. The Davenport Hotel, photo undated, courtesy of the Washington State Digital Archives. So, was Kirtland Cutter the actual architect of the Davenport Hotel or was it G. A. Pehrson? In searching for the answer to that question, my colleagues and I have unearthed newspaper articles, personal testimonies and professional documents bearing Pehrson’s signature that could suggest that Pehrson was the actual architect. We’re interested in finding any further evidence, one way or the other, to help answer our question. Kirtland Cutter once referred to architecture as “art incarnate.” Whenever I visit one of the buildings he and my grandfather created together, I stand with and within my grandfather’s spirit. I have deep respect for my grandfather and all he accomplished in his life. I also have deep respect for Kirtland Cutter, who enabled my grandfather to transcend starting with few social contacts and using English as a second language, to see his American dream come true. That heritage is mine, now, to share, and yours to know. Gustav Albin Pehrson is the undisputed architect of many beautiful and iconic buildings. According to my grandmother, one of those buildings is the Davenport Hotel. Curtis Richardson, who was the architect for the University of Idaho and Lewiston State Normal, also worked on the Davenport. So, when was this article published? I would like to bookmark it in my library. Hi Terisa! Bob’s article was originally published in the Sept-Oct 2016 issue of Nostalgia Magazine. 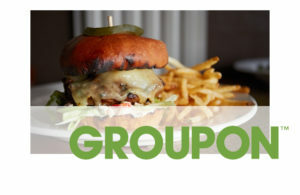 Thanks so much for your post!